I have wanted to go to Disneyland Hong Kong for a long time so I put a visit to Hong Kong Disneyland high on my list of things to do when I first arrived in Hong Kong. I arrived at the Hong Kong Tourist Information office at 9.15 AM sharp the next day. I stumbled into the tourist information office located on the Star Ferry Concourse in Tsim Sha Tsui. The three girls working there giggled but 2 of them were ugly so I didn't mind much. I sat at the desk of the prettiest girl, ignoring the 2 others. What should I have done? How many chances am I going to get to meet a girl and fall in love? "I want to go to Disneyland Hong Kong... or is it Hong Kong Disneyland?" I asked. The girl just looked at me. It's just called Disneyland to us. It just happens to be a Disneyland IN Hong Kong." I felt like a retard and she had enjoyed it. How do I get to Disneyland Hong Kong? "Most visitors to Disneyland HK are families. They will usually book a night or two at one of the 2 hotels inside the Hong Kong Disney Theme Park. The 2 hotels are The Hong Kong Disneyland Hotel and Disney's Hollywood Hotel. "After that, most people simply book the Disneyland Theme Park Roundtrip Transfer to get to the Theme Park and the Disney Hotel." "It is by far the most convenient and hassle free way for anyone to get to and fully enjoy a visit to the Disneyland Theme Park." She looked up from the map and into my eyes. "This method is the most effective way to build a comfortable and guaranteed vacation without paying travel agent fees who insist that you need a guide." I looked back at her. It felt as though I had no choice but to reveal myself. "I have little money and no family. What is the cheapest way to see the Disneyland Hong Kong Theme Park?" She looked at me differently after that. I was not as important anymore. Even at my age the memory of Disneyland and the Disneyland hotel that we stayed in as a family when I was a boy is one of my fondest memories. She went on but she never looked up from the map again. The top of her head had a perfectly straight line where she had parted her hair. The black silk brushed back and forth over the perfect skin of her puffy cheeks. She went on. It was work to her now. "Another way to get to Disneyland Hong Kong is on the MTR (Mass Transit Railway). There are maps everywhere along the route to your destination. "Make sure to get on the 'Tung Chung' Line and head to the 'Sunny Bay' MTR station. Exit the train when you arrive at the 'Sunny Bay' MTR station." "Disneyland Hong Kong has its own MTR line. It connects directly to the 'Sunny Bay' MTR Station. At the 'Sunny Bay' station you can access the adjoining 'Disneyland Resort' line. It may look or sound difficult but you can't miss it." "That line will take you to the 'Disneyland Resort' station terminus. "It's a long ride and you'll need to make one transfer on the MTR before you're on the right path." She stopped talking and looked me. She knew I was too cheap to take the air-conditioned, never get me lost bus. It was a joke to her and it was obvious that she wanted me to leave. But only handsome men can afford to give up so easily. "How long does it take to get to Disneyland Hong Kong from the 'Tsim Sha Tsui' MTR station?" I asked. "It takes about 45 minutes to get to the 'Disneyland Resort' terminus station, Sir." "And on that Deluxe Bus?" I asked. "Where exactly is Disneyland Hong Kong?" She frowned and resigned herself to her duties. She ducked behind the desk and pulled out a great big map that she spread out over her desk with careful hands. I leaned in over the map that covered her entire desk and tried to smell a hint of perfume. "Disneyland Hong Kong is in Penny's Bay on Lantau Island," she said, pointing at a spot on the map with her smallest finger. "You have beautiful eyes," I said in my softest tone. She'd had enough and ignored the comment. "What if I want to phone them and ask some questions? What's your phone number?" I emphasized the YOUR part. She was quick to catch on. "You can make any inquires directly to the Disneyland Hong Kong help line at +852 1830 830 from 9AM to 6PM everyday. "No, thank you." She cut me off in mid-sentence. "You are very beautiful," I said. She looked soured by the remark. "You are not very handsome, Sir." "Maybe you could have dinner with me tonight?" I suggested. "Oh," she said, taking out a pamphlet of some sort and then reading from it. "You will find plenty of company at either the Disneyland Hong Kong Theme Park, the Hong Kong Disneyland Hotel or Disney's Hollywood Hotel. I know that many of the cartoon animals such as Mickey Mouse are seen there. Both her co-workers erupted in giggles. I stood up as quickly as I could and walked out. I should have just phoned them on their hotline at (+852) 2508-1234. I felt better once I was outside and walking. It's a 5 minute walk from the Star Ferry Terminal to the Tsim Shu Tsui MTR station. The MTR is as fast as lightning and comes every few minutes. I was on my way to good old Disneyland Hong Kong in no time. But I was upset by the girl at the Hong Kong Visitor Information Center. I wasn't looking forward to the trip to Disneyland any longer. The thought of all that silliness with those bizarre walking Mice and Ducks no longer held any appeal. I was going to kidnap Mickey Mouse. It was then that I decided to do something illegal, stupid and just plain crazy. Where Do I Buy Tickets for Disneyland, Hong Kong? You can buy entrance tickets to Disneyland Hong Kong right at the Gates to the Park or at the Hong Kong Disneyland Ticket Express. The Ticket Express is in the concourse area of the 'Tung Chung' MTR Station. It's open from 9am to 7pm from Monday to Friday and from 9am to 5pm on Saturdays, Sundays and Public Holidays. Or just buy your tickets online at hongkongdisneyland.com and find your way there on your own. If you buy your ticket online then it is valid for 6 months after you purchase it. Children under 3 years old are permitted into Hong Kong Disneyland free of charge. Tickets prices listed above are in Hong Kong dollars and are subject to change. I arrived to a welcoming cheer and a dance from the famed residents of Disneyland Hong Kong. Donald Duck was there and Goofy and Mini Mouse and basically all of them gathered to greet the train. I had a hard time smiling. Few people could watch Goofy dancing and Mickey and Mini Mouse so joyful without smiling. But few people had probably ever done what I was going to do. Mickey Mouse was smaller than me but still big for a mouse. I wondered how I was going to subdue him and get the information I needed. I hung around the Park for quite some time. I watched Mickey Mouse with a keen eye. I was looking for a limp or a sagging shoulder. Even though it didn't really matter until he was alone. Goofy was at his side like a tall bean stock with thorns for teeth. No, I needed to wait until Mickey was alone. I followed him for most the next hour. He was always with his buddy Donald Duck or Goofy again so I waited for my chance to get him alone. Meanwhile I took notes as I walked around Disneyland Hong Kong. 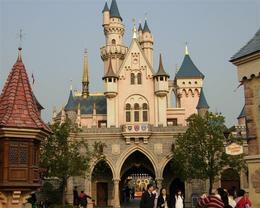 The actual Disneyland Hong Kong Park is only 310 acres (126 hectares). It includes a Theme Park with four distinctly separate lands and two themed hotels. Learn more about The Hong Kong Disneyland Hotel. It's the smallest of all the Disneyland Theme Parks and lacks the feeling of being in a wide-open space. Even the big castle looks like it was built in a hurry. There's just something about the way it sits there, almost off-keel and slumping, waiting for a brisk wind to blow it away. Mickey Mouse finally walked away from the group of talking animals. I could tell he was seeking privacy so I followed him closely. He walked around the back of one of the buildings in 'Tomorrowland' and disappeared through an unmarked doorway. I didn't like going into a building without knowing the lay of the land first. I waited by the doorway through which Mickey Mouse went. I pulled the heavy rope out of my jacket pocket and seized each end tightly. When Mickey finally came out, I came up from behind him and wrapped the rope around his chest. But Mickey Mouse was not like the one I grew up knowing. The one in Disneyland Hong Kong knows some kind of martial arts akin to Kung Fu Bruce Lee Style. He threw his legs up over his shoulder and kicked me in the head with those huge black shoes. I dodged the second kick and held on to him from behind, the rope around his chest restraining his hands. Mickey finally wore himself out trying to break my hold. He tired and fell to his knees. I hauled him behind a heavy patch of shrubs and sat him up against a tree. Mickey was looking at me. He was breathing heavily and was angry. But he could never wipe the smile off his face. "I'm really sorry about this, Mickey. I'm a desperate man right now. I need information about Disneyland Hong Kong and there is no better man than you to tell the hidden secrets I need." "Need for what?" He asked, catching his breath and looking around with his big head and massive ears that shone in the sunlight. Mickey looked at me oddly. "You kidnapped me to get information about Disneyland Hong Kong? Why didn't you just get a brochure?" "Oh, all the other websites are copies of old brochures. Besides, it isn't kidnapping if the victim is a mouse. I looked it up before I came here. I'm not stupid," I said. "Dude," Mickey was calm and his tone pleading. "I'm not a friggin' mouse. This is just my job." It made me angry. He didn't need to insult me. I jumped up, wrapped the rope around his lower waist and tied him to a tree. I sat down before him and off we went. "What are the people working here like? Do they speak English?" "Yes, the Theme Park's cast members use both the English and Chinese Languages (Both Cantonese and Mandarin Dialects) to communicate verbally. Guide maps are printed in both traditional and simplified characters and also in Japanese. "Excellent, Mickey." I had my pad of paper out and was writing furiously. When I looked up I suddenly wished I had brought my camera. Seeing Mickey Mouse tied to a tree would give my website credibility. "What's the layout of Disneyland Hong Kong?" I asked the big Mouse. He looked at me with his mouse eyes. I guess he was looking to see if I was serious. I was and he got to business. "There are Four distinctly different areas to the Park," he began. "Each of the four separate areas of the Disneyland Hong Kong Park has a distinctive theme much like all other Disneyland Parks. "Fantasyland is really for the Kids. Adults tend to enjoy it through their kids or reminisce of their own Childhoods. This is where you'll find characters such as Mickey Mouse, Winnie the Pooh, Cinderella, Sleeping Beauty and other well-loved characters. "The rides are more interactive attempts to bring these characters to life through Animated Stories held in what appears to be a quaint storybook village." "Sounds nice. You are on a roll now Mr. Mouse. Are you comfortable?" He looked down at his crossed legs as he sat on the green grass with the shrubs behind him concealing us both. "No. You should let me go." "Can't. Sorry. But the sooner we get through this the sooner I'll let you back into your Enchanted Village. So go on. Describe the Park and the rides." "Do you think I live in Fantasyland?" He asked. "Just keep talking," I said. But in my heart I was dying. To put Mickey Mouse through this was a terrible thing to do. He had been my hero since I was a Child. Mickey's PhilharMagic is a 12-minute long show featuring 3D effects and interactive smells featuring a number of characters from Disney movies. It is all shown on the largest purpose built 3D screen ever made, at one hundred and fifty feet wide. It's a Carousel featuring all the characters associated with Cinderella. The Many Adventures of Winnie the Pooh is a dark ride based upon the film The Many Adventures of Winnie the Pooh. The sixteen ride vehicles are each shaped like Dumbo and are mounted on articulated armatures connected to a rotating hub. The passengers ride in the "Dumbos" and can maneuver them up and down with a joystick which operates a hydraulic ram. The ride itself rotates counter clockwise at a constant rate. The theme is future technology and warp-speed navigation of the universe and all things futuristic. Some of the rides are full-out and the loved by many. An Outer Space themed indoor Roller Coaster. "This place is made up to look like a Jungle in the Amazon with river boat rides on hippo-filled rivers and ventures that seem to go to the very heart of uncharted jungles where you might find Tarzan's Treehouse." This is what Walt Disney envisioned as the ideal American hometown. This quaint boulevard exudes the small-town charm of more than one hundred years ago. "And that is the layout of the Park. The Park is no different to any other Disneyland but for a few Asian twists here and there." "That's It? Where the Hell is Frontierland?" "There's no Frontierland, my friend. But it may be included in future expansions," he explained. "Maybe? What do you mean 'Maybe'?" You're Mickey freakin' Mouse for crying out loud!" I'd lost my temper with Mickey Mouse. I had fallen into the Evil Pit with other sinners who had scorned a great Deity. "Just please be helpful," I begged. "I'm trying. What are you doing this for, anyway?" "I do stupid things. I never know when or why." Give me more. Why have you taken me hostage?" I want to write a web page that people can come to and get real information about Disneyland Hong Kong. Where to buy tickets and if there is a Disneyland Theme Park Roundtrip Coach Transfer to bring me to Disneyland Hong Kong and back to my hotel. Everywhere is book-like information about Disneyland Hong Kong. I wanted to find something more...something that would make the page worth reading." "A romantic. I just lost all my fear of you. The passion in your veins is of good intention. I will help you willingly." I looked at him suspiciously. I had treated him poorly and I had no doubt that he would ring the Disneyland Hong Kong police as soon as he got the chance. I untied him from the tree but kept his hands bound. "Then tell me what I ask," I asked in a low tone. What Entertainment Or Celebrations Go On During The Day? "Well. Every Disneyland in the world features 'Disney on Parade'. It's a huge parade with floats and all the characters from Disney movies and cartoons. We just hate it but smile and wave anyways. I know the people love it so the Parade is around noontime." Come on, Mouse, I pleaded. "Give me some useful information that's not already everywhere." Mickey took to thinking then looked up at me. "There are too many things going on anyway. The fireworks show over the Castle is a must-see. They call it "Disney in the Stars" and even I'm not yet sick of watching it." Even if it rains we do a variation on the 'Disney on Parade' theme. It's called 'Disney's Rainy Day Express' and consists of a specially design train with me and all the other Disney Characters wearing brightly colored rain coats. "There is some dirt. The Disney Corp and the Chinese Government are in love. I mean, they share the same goal and have no opposition," he explained. "This suit that I wear has odd powers. It makes me both the center of attention and invisible at the same time. Do you understand? I mean, people would be shocked if I took off my head and they saw a human underneath." "Officers from the Food and Environmental Hygiene department arrived one day. The top brass Disney staff told them to take off their badges and caps in order to enter the park. The officers investigated a food-poisoning case in one of the park's restaurants. "Fred Li is the chairman of Legco's Food Safety panel. He described the incident as shocking and called on the director of the department to take follow-up action against Disneyland Hong Kong. But the Secretary for Justice said that the government did not have enough evidence to make a prosecution and the case was dropped. "The Disney Guys laughed and remarked about how they would never get away with that in America." "Okay. That's cool. I should go. This isn't going to be something people want to read about." I untied Mickey's hands. As soon as I did he reached up and removed his head. Underneath was a slim man with a boney face and a long hooked nose. I turned from him and began to walk away. "So, you want to build a website about Travel around Asia?" He asked. "Yes. But I've been a year at it and I'm thinking of it giving up." Mickey Mouse was now a man holding Mickey's head against his hip. But he was shaking his head and looking at me with disapproval. "Look at me. Look at me. I'm 44 years old and working as a talking Mouse for people's amusement." Tears began to well in his eyes as he spoke. "My wife thinks I'm a Grounds-keeper or Gardener if you like. Is that crazy? I'm pretending to be a gardener so no one finds out what I really do." This was too much for me. I turned away from the sobbing man and began to walk away. I didn't want to miss the parade or the fireworks. I could hear Mickey Mouse still crying and sobbing as I walked out from behind the patch of shrubs. Even after I had walked far away from Mickey, I could still hear him sob. At least the sound of it died out as I got further away from him. I'll never do that again. Even for the sake of finding something that justified this website even taking up space. Just remember. You don't have to watch this video. It's a promotional video for Disneyland, Hong Kong with all the best known faces of the Hong Kong entertainment industry making appearances. It's just funny to watch and it gets ya in the mood for good old Disneyland, Hong Kong.